Create and print business cards. 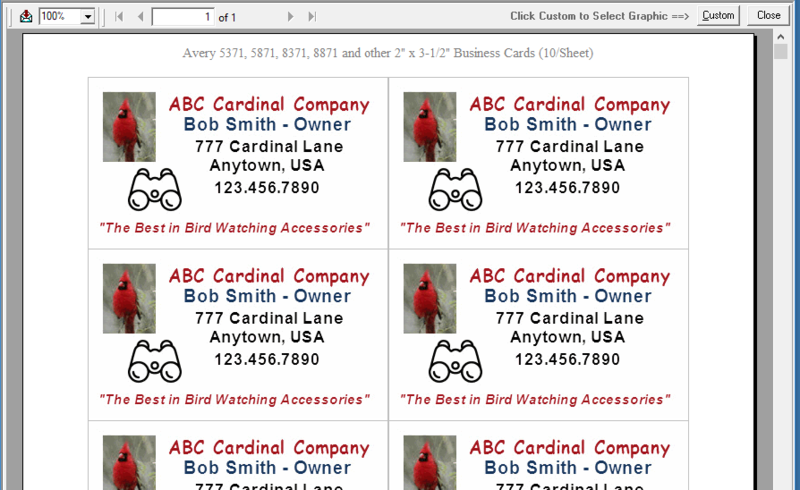 Select 'Business Cards' from the Features Menu to print business cards. EZ prints one sheet of business cards at a time (10 per sheet). However, you can select the number of copies to print when printing. 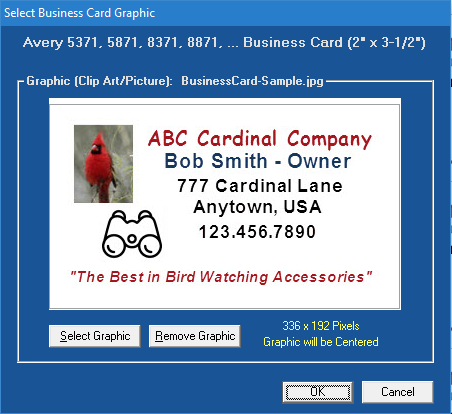 Business Card: 2" x 3-1/2"
Avery Sheet: 10 Cards Top/Bottom Margins 1/2" Left/Right Margins 3/4"
With 'Select Features' on the Tools Menu you can remove Business Cards and other functions to simplify the program. Business cards screen shot and information below. Click the 'Custom' button at the top of the screen to select a graphic. EZ does not have the ability to add text to the business card. Select a graphic (JPG, JPEG, GIF, BMP) from anywhere on your computer. The graphic is automatically copied to the EZ Graphics Directory if not already there. The exact size of a graphic to cover the entire business card is 336 x 192 pixels. Smaller graphics will be centered and larger graphics will be resized. You need to create your own graphic. You can change the zoom percentage by selecting from the drop-down list in the upper left corner. Select Options from the Tools Menu to change the default zoom. All reports use the same default zoom. Click on the toolbar, use Ctrl+P, or select 'Print' from the File Menu to print business cards.